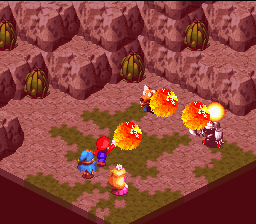 Ultra Flame is the last fire magic move Mario learns in Super Mario RPG: Legend of the Seven Stars. Mario learns this move at level 18, and it costs 14 FP. When used, Mario shoots a large amount of fireballs at enemies. This attack is stronger than both Fire Orb and Super Flame. Unlike the other two fire-based attacks, Ultra Flame has the potential to deal damage to all enemies. To perform the attack successfully, the player must hit the button repeatedly. Mario's Final Smash in the Super Smash Bros. series, Mario Finale, is very similar to the Ultra Flame. This page was last edited on June 16, 2018, at 22:38.